The orange blanket Mom and I knit together. Photo by Jeff Norris. I recently remembered a sermon I had written during my intern ministry in 2008. It was about spiritual disciplines and I talked about how knitting is a spiritual discipline for me. The story I used to illustrate this point was about me and my mom knitting a blanket for my son. I look back on that story from just two and a half years ago, and see how much has changed. Mom can barely knit a few stitches anymore. Yet we still go to our knitting group together and I still help her knit as best I can. You will see at the end I mention not needing to move home to care for Mom, but just a few months later, her dementia and Parkinson’s progressed quickly. Life lined up to enable me to move back home and still follow my calling as a minister. “I have been knitting with my mom for about five years now. I knew this has been a spiritual discipline for me, but one that I thought was too much of a hobby, so I looked for a more traditional spiritual practice, like meditation. I think this past weekend was when I finally understood just how much of a spiritual discipline knitting is for me, and I do not need to look for something more traditional. For months my mom has been knitting my son a beautiful orange blanket which has been a joy for her to knit, but also a struggle. It is a struggle because my mom has Alzheimer’s and so things that were once easy for her to do are now hard. A blanket that would have taken her a few weeks to complete before now takes months. This weekend the orange blanket was the size of a baby blanket and we thought it was probably done, until we laid it over Jeffrey, who is four years old, and it was too small for him. Mom really wanted to keep knitting the blanket for Jeffrey, but I knew that this had been a hard and time consuming project for her. It was frustrating for her because she would get confused and think she had made a mistake, or she made mistakes that she could not figure out how to fix so she had to wait for a friend who was able to help her. Even making one stitch is a struggle. She wanted Jeffrey to have the blanket sooner rather than later so I told Jeffrey that Mom really could not make the blanket any bigger because it was just too hard for her to knit anymore. But Jeffrey told me he “had a solution to my problem.” He said that I could knit the rest of the blanket so it would be knit by both me and my mom. I thought about Jeffrey’s suggestion a lot. I did not want to take over Mom’s project, but I also knew that she was having a very hard time knitting it and really wanted to see it done so Jeffrey could use it. Eventually I asked mom if I could knit the blanket and she said I could. So one night, I started knitting the blanket. I sat and talked to my dad and husband about life, religion, and family as I knit the blanket. That night Mom could not sleep and she ended up sitting and talking with us too. I tried to make sure that my stitches matched my mom’s so that the blanket looked the same, not half knit by me and half by Mom. I wanted it to be one cohesive piece, a blend of the both of us. Since starting seminary two and a half years ago, I have barely had the time to knit. 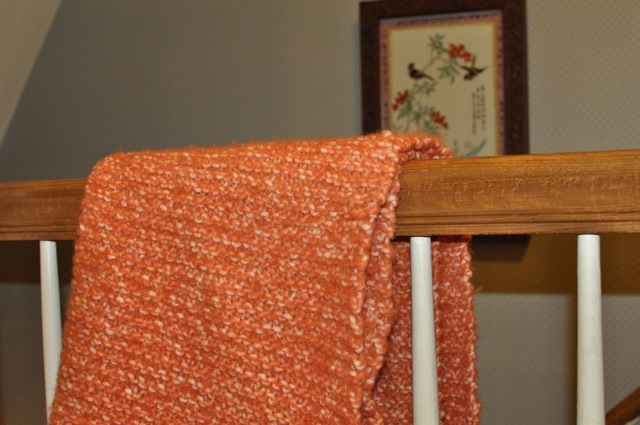 As I was knitting this orange blanket, my husband asked me if I missed knitting. I realized that I did miss it. I was interested in why Jeff asked me if I missed knitting. He said he asked me because I looked focused when I was knitting, like I was in a flow of mind and motion. I realized that all of my counting and breathing in Zen meditation was what I was doing when I was knitting. I was letting my mind stay clear, to think of things but not ruminate on them. As I knit that blanket, I was also discovering my place in the universe, as a daughter, a mother, a helper and a person who struggles with sadness and love. Whereas a year ago I would have felt that I had to quit seminary and go home to be near my mom, I was now finding that I would always be with my mom no matter where I was. I also knew that she wants me to be who I am. She would not want me to ignore my calling to be a minister in order to come home. But in that blanket, I was with her. She and I are both with my son when he uses the blanket. The love and hopes that we have for each other and the love and hopes we both have for little Jeffrey, are all in that blanket. I found your blog searching "knitting and spirituality" on Google. This is such a beautiful post, and a beautiful story. I had never made this connection between knitting and dementia before, and I really appreciate it. Knitting is such an important part of my own spirituality, especially while in seminary (it's also a great de-stresser). I really appreciate reading others' insights into knitting. Thank you!